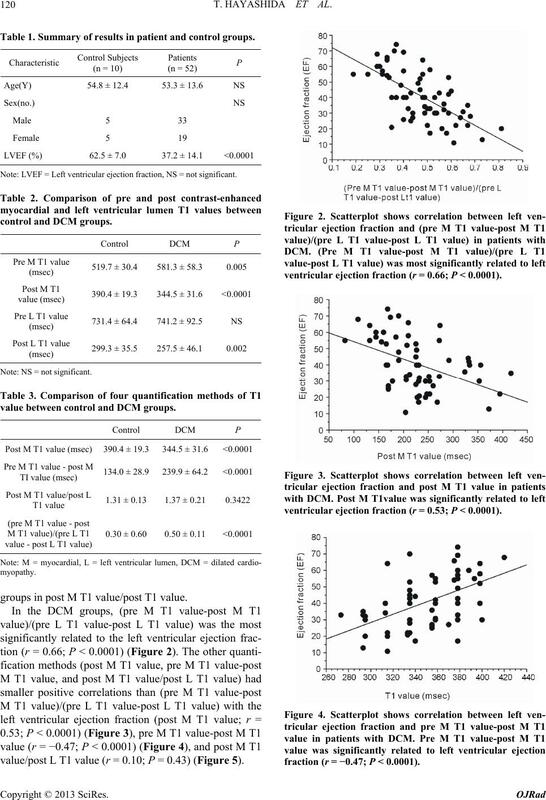 L T1 value-post L T1 value) was the most reliable quantification method to estimate the severity of DCM. ate the enhancement of myocardium precisely. of DCM using T1 value. formed to rule out various myocardial diseases. protocol was approved by a medical ethics committee. be- fore inversion time scout images were obtained. lumen TI0 values for each subject (Figures 1(a) and (b)). preparation times to the exponential curve. L T1 value-post L T1 value). 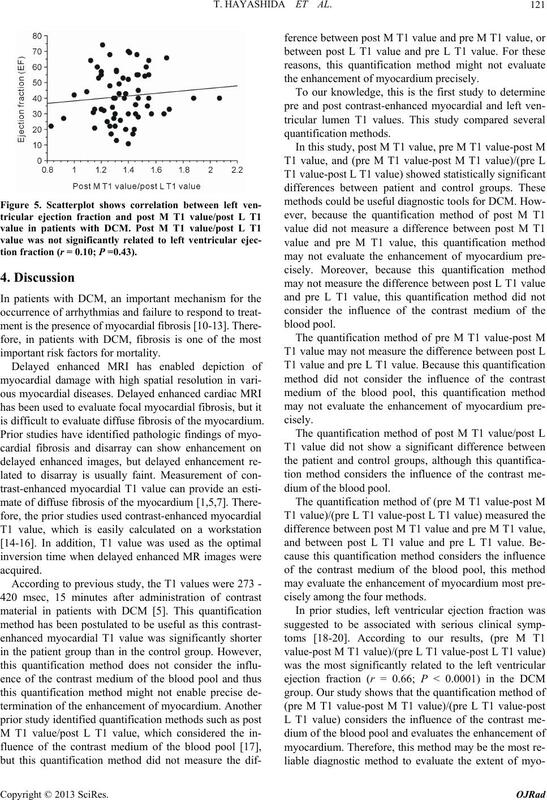 of left ventricular ejection fraction with all TI0 values. considered significant (SPSS, release 11.5; SPSS). 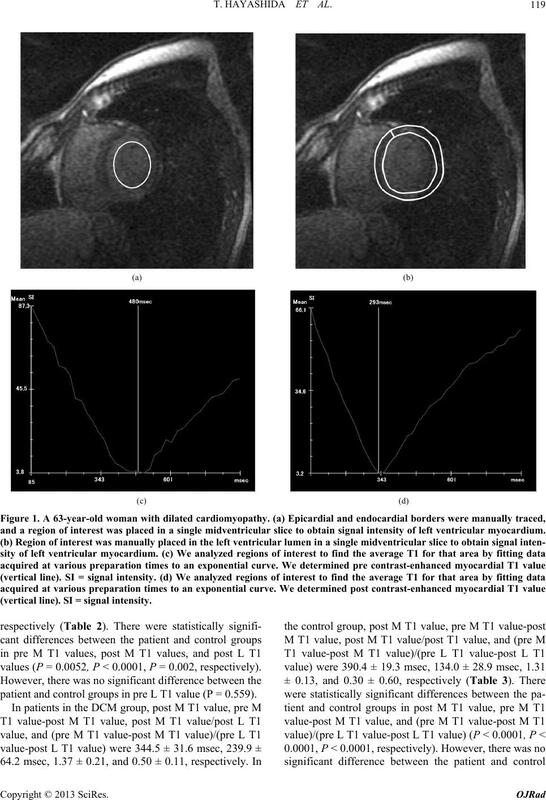 and a region of interest was placed in a single midventricular slice to obtain signal intensity of left ventricular myocardium. (vertical line). SI = signal intensity. values (P = 0.0052, P < 0.0001, P = 0.002, respectively). patient and control groups in pre L T1 value (P = 0.559). Table 1. Summary of results in patient and control groups. Note: LVEF = Left ventricular ejection fraction, NS = not significant. Note: NS = not significant. value between control and DCM groups. groups in post M T1 value/post T1 value. value/post L T1 value (r = 0.10; P = 0.43) (Figure 5). ventricular ejection fraction (r = 0.66; P < 0.0001). ventricular ejection fraction (r = 0.53; P < 0.0001). fraction (r = −0.47; P < 0.0001). tion fraction (r = 0.10; P =0.43). important risk factors for mortality. 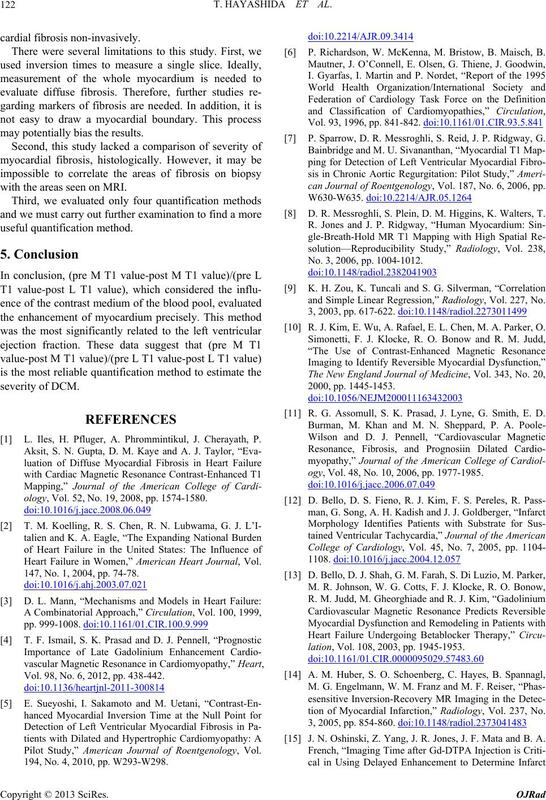 is difficult to evaluate diffuse fibrosis of the myocardium. 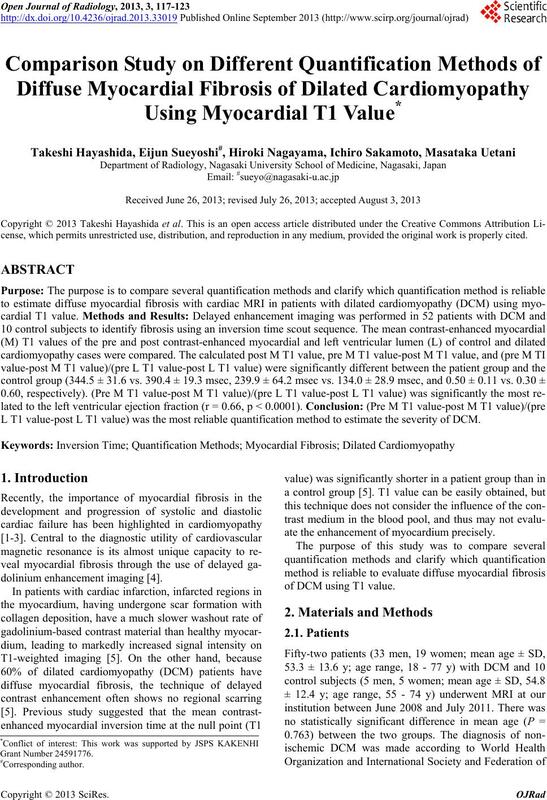 the enhancement of myocardium precisely. dium of the blood pool. cisely among the four methods. may potentially bias the results. with the areas seen on MRI. L. Iles, H. Pfluger, A. Phrommintikul, J. Cherayath, P.
ology, Vol. 52, No. 19, 2008, pp. 1574-1580. Heart Failure in Women,” American Heart Journal, Vol. 147, No. 1, 2004, pp. 74-78. Vol. 98, No. 6, 2012, pp. 438-442. Pilot Study,” American Journal of Roentgenology, Vol. 194, No. 4, 2010, pp. W293-W298. P. Richardson, W. McKenna, M. Bristow, B. Maisch, B.
 P. Sparrow, D. R. Messroghli, S. Reid, J. P. Ridgway, G.
can Journal of Roentgenology, Vol. 187, No. 6, 2006, pp. D. R. Messroghli, S. Plein, D. M. Higgins, K. Walters, T.
No. 3, 2006, pp. 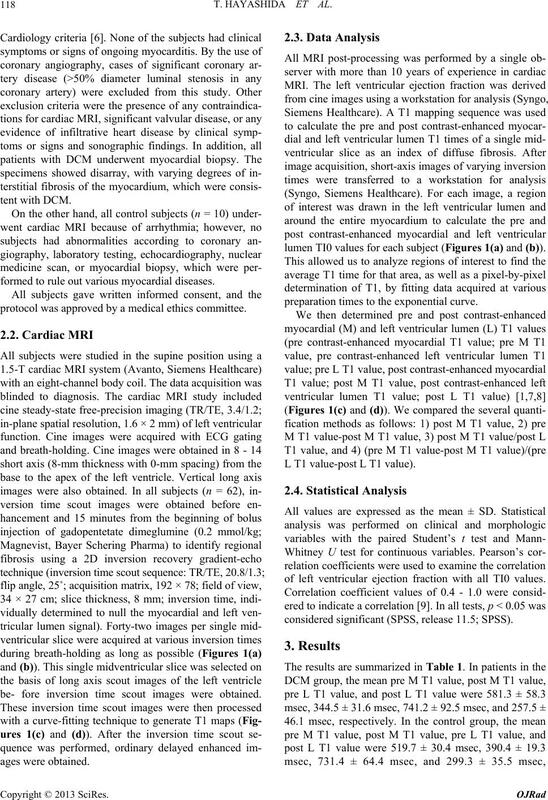 1004-1012.
and Simple Linear Regression,” Radiology, Vol. 227, No. R. J. Kim, E. Wu, A. Rafael, E. L. Chen, M. A. Parker, O.
 R. G. Assomull, S. K. Prasad, J. Lyne, G. Smith, E. D.
ogy, Vol. 48, No. 10, 2006, pp. 1977-1985.
lation, Vol. 108, 2003, pp. 1945-1953.
tion of Myocardial Infarction,” Radiology, Vol. 237, No. J. N. Oshinski, Z. Yang, J. R. Jones, J. F. Mata and B. A.
culation, Vol. 104, 2001, pp. 2838-2842. C. Klein, S. G. Nekolla, F. M. Bengel, M. Momose, A.
Sammer, F. Haas, B. Schnackenburg, W. Delius, H.
Tomography,” Circulation, Vol. 105, 2002, pp. 62-167. 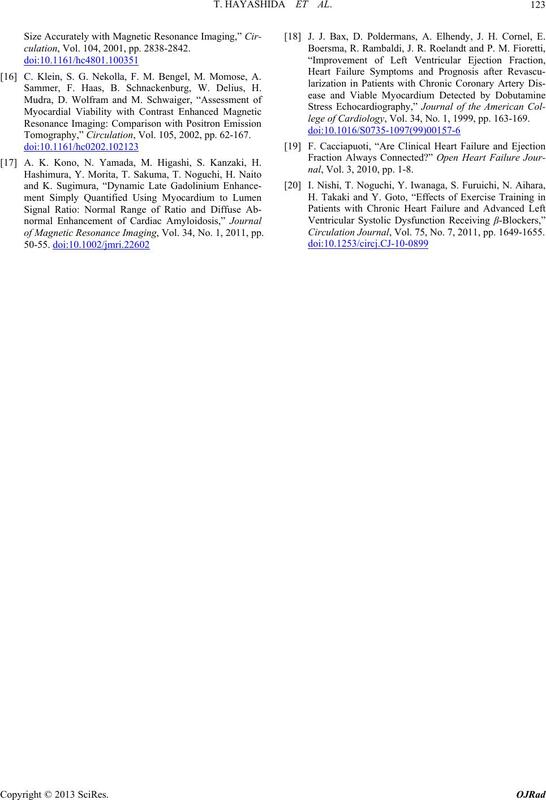 A. K. Kono, N. Yamada, M. Higashi, S. Kanzaki, H.
of Magnetic Resonance Imaging, Vol. 34, No. 1, 2011, pp. J. J. Bax, D. Poldermans, A. Elhendy, J. H. Cornel, E.
lege of Cardiology, Vol. 34, No. 1, 1999, pp. 163-169.
nal, Vol. 3, 2010, pp. 1-8. Circulation Journal, Vol. 75, No. 7, 2011, pp. 1649-1655.